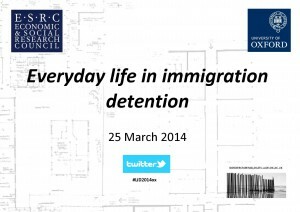 On March 25, 2014, Border Criminologies hosted a seminar entitled Everyday Life in Immigration Detention (#LiD2014ox). The third in an ESRC-funded series on immigration detention and convened by Mary Bosworth, this event drew together former detainees, academics, and representatives from government and non-governmental organisations to explore detention from variety of angles: as it’s experienced, researched, monitored, and governed. These different perspectives emphasised the current issues and challenges in immigration detention, and allowed comparisons of immigration detention centres and the problems faced by detainees across a number of countries (including UK, Greece, Norway, India, Italy, and Belgium). 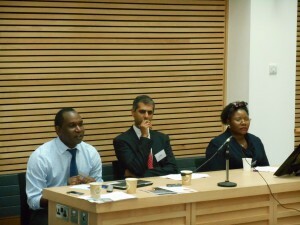 The seminar began with a session focusing on the experiences of everyday life in immigration detention. Hindpal Singh Bhui, an inspection Team Leader in HM Inspectorate of Prisons (HMIP), explained the powers and aims of the HMIP in the UK as a key independent institution monitoring daily aspects of life in detention. Most of HMIP’s recommendations are accepted by the custodial companies, although fewer of them are achieved. For Hindpal, the power of HMIP rests in its independence and impartiality, as well as in its powers to communicate with the media and publish its findings. HMIP inspectors deploy a wide range of skills to monitor everyday life, and benefit from a mixed-methods approach to data collection. Following Hindpal, there were two remarkable and moving accounts of two former detainees, Beatrice Botomani and Kizza Musinguizi. Beatrice recounted her experience of arrest and arrival in Yarl’s Wood IRC with her children in 2009. She had long feared ‘the expected knock on the door at dawn from immigration officers.’ When it occurred, Beatrice and her children had to pack quickly for a long journey to Yarl’s Wood. In detention, she recalled, the children witnessed suffering and sadness, while she had to maintain a facade of strength for their sake. Surrounded by fear and uncertainty, she decided to fight her deportation. Although eventually successful, detention has cast a long shadow on herself, her children, and their relationship. Kizza’s experience of detention was similarly powerful and painful (Click here to hear talk), but had a different focus. Kizza had not been living in Britain for long when he was detained. Unlike Beatrice, he had not anticipated that he might be confined, and it took him some time to understand what was happening. Like Beatrice, Kizza resisted his deportation, yet he found it very difficult to obtain legal representation. In the end, it was largely due to assistance he received from the local Member of Parliament for the area in which Harmondsworth IRC that his case began to change. Kizza was detained in a number of IRCs and found the movements particularly difficult to deal with and understand. Like Beatrice, he too was released and has now built a life in the UK. Kizza and Beatrice took different paths after detention in deciding whether to challenge their detention in the courts, and both found that their choices helped build a future in the UK. Both are working towards making the voices of detainees heard outside detention. 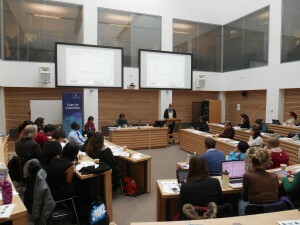 In the discussion that followed the first panel, a number of additional themes were examined in more detail. Considerable time was spent talking about staff and their relationships with detainees. The casual dehumanisation of detainees (e.g., by reference to detainees by their numbers rather than their individual names) was widely criticised, while some account was given of the positive support shared among detainees. Differing views were offtered about the role of activities and, in particular, the legitimacy of paid work in detention as helping to pass the time and manage stress. The second session focused on academic accounts of researching everyday life in immigration detention. Sarah Turnbull outlined some methodological challenges of undertaking ethnographic research in detention, from gaining access to building trust (Click here to hear talk). She spoke about the difficulties of doing research in IRCs, and identified important differences between male and female centres. The indefinite and unpredictable nature of detention made time management and planning difficult. Low levels of trust are often exacerbated by language barriers, gender and racial identities, expectations about ‘help’ and advice, and by the constant movement of people in and out of IRCs. Following Sarah, Thomas Ugelvik presented on his field research at Trandum detention centre in Norway (Click here to hear talk), discussing the ways that detention centres aim to achieve legitimacy. In Norway, this was achieved by criminalising immigration offences and ‘prisonising’ detention centres in terms of the physical space, staffing, and procedures. Thomas indicated that the ‘improvements’ of the physical conditions at Trandum were also driven by high levels of media coverage and public opinion. The group discussion following the second session considered some the practicalities of doing research in detention, particularly gaining and maintaining access, and building trust. Some participants had been denied permission to interview detainees and wanted to advice on how to promote a more research friendly environment. 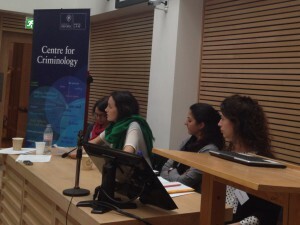 Broader issues regarding the purpose and legitimacy of immigration detention were also explored. There was some discussion as to whether the ‘prisonisation’ of detention produced ‘better’ conditions for detainees, and what sorts of alternatives to detention are available. In her presentation, Rimple Mehta explored how Bangladeshi women held in prison for immigration offences in India dealt with the difficulties of detention (Click here to hear talk). Specifically, she discussed how some of the women looked and sometimes found love inside. The women in her study found thinking and romanticising about loving relationships helped them cope with everyday life in detention, and allowed for cathartic expressions and the maintenance of their gender identities. Rimple’s research on affective questions of love, longing, and identity in detention highlighted the centrality of human relationships in everyday experiences of detention, echoing the insights of Beatrice and Kizza from earlier in the day. The final session offered a range of NGO perspectives. The first speaker was Sarah Campbell from the UK-based non-profit Bail for Immigration Detainees (BID) (click here to hear talk). BID plays an active role in helping detainees apply for bail. Sarah observed that restricted access to legal aid and time constraints due to fast-track asylum applications pose additional challenges for detainees. She also highlighted other issues that especially vulnerable groups of detainees―pregnant women, parents separated from their children, and those with mental and physical health problems―face in immigration detention. The final speakers for the day, Andriani Fili and Angeliki Pangoulia, described the parlous state of immigration detention in Greece. They described physical and material conditions of detention as miserable and inadequate yet the Greek media and public reaction are largely indifferent. Detainees in Greece have no access to legal representation, and there is little recognition of refugee and torture experiences among those who are detained. The poor conditions were considered by the Greek government to be a necessary method of deterrence for other migrants. NGOs in Greece felt powerless to voice their concerns, monitor the situation, or influence policy. 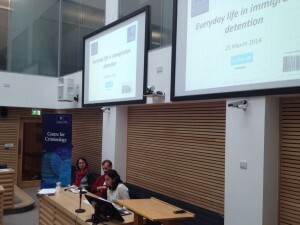 All told, the ‘Everyday Life in Immigration Detention’ seminar revealed a series of common concerns within some institutional and regional differences. Dehumanisation, inadequate access to legal aid, and the treatment of vulnerable persons were all common complaints. At the same time in every instance, examples of resistance, support, and sympathetic staff were also identified. As ever, it seems, much work remains to be done on detention, with, by, and for detainees. Note: Audio recordings of many of the presentations are available here or on iTunes.